TSPlayer.com is a project that was launched in 2006 and has been gaining popularity since then. It is a collection of audio and video products for web and mobile devices, which can be used with WordPress and Dreamweaver, but is also available as standalone software. Our best software developers, designers and web security experts are assigned exclusively to this project. SecureTSPlayer is a Flash Music Player software for websites, designed specially for people that need to protect the audio files from unauthorized downloads. Users can listen to the song, but can not access the playlist, can not download the mp3 file and the file is not accessible for unauthorized downloads. With SecureTSPlayer the audio files are not cached by the browser. All that you need, especially if you are a music vendor. Allow your users to listen to the music without capacity to download the files. SecureTSPlayer has a lot of additional features, such as: support for RSS podcasts, optional buffering or streaming mode, compatible with dynamic playlists and more. All this is packaged as a Dreamweaver Extension, or can be installed manually, making it a powerful music player that is very easy to use. 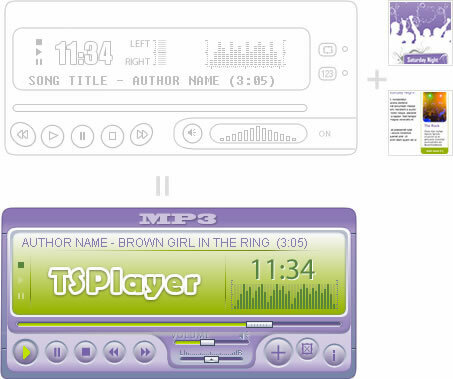 A music player may be built with our visual interface by selecting the desired visual environment, but you may also order a unique and special music player design for your website. The information you give will serve as a guideline for designers of the visual environment you need and expect. We guarantee the exclusivity of your music player design that will make your website totally unique. Custom solutions are available starting from just US$ 25.00. The development time can be as speedy as three working days depending of the revisions required. This was a speedy and punctual service. Instant download, instant product, instantly working. The experience was everything good service should be! I am very happy with the program it was just what I was looking for and I would definitely buy from them again.